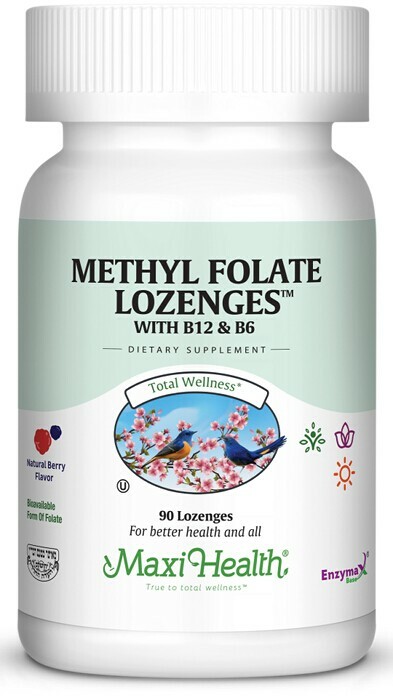 Maxi Health is pleased to introduce its berry flavored Methyl Folate Lozenges™ with B12 & B6 for those who need to take folic acid but have trouble converting it. Not only that, we have the perfect combination for prenatal, nerve, red blood cell, and heart support. Just as we added the most bioavailable form of folate, so too, we have added the B12 you are looking for as methylcobalamin and B-6 as pyridoxine HCI. Dissolve one (1) lozenge in mouth upon arising, or as directed by a healthcare practitioner. Other Ingredients: Sorbitol, croscarmellose sodium, vegetable magnesium stearate, natural strawberry flavor, vegetable stearic acid, Enzymax® (calcium carbonate, bromelain, papain, lipase, amylase, protease, silica). This product contains no animal products, soy, wheat, salt, milk, gluten, yeast, sugar, artificial flavors, colorings or preservatives. Quatrefolic® is a trademark of Gnosis S.p.A.